As soon as you do, Facebook opens a new web browser window, and displays the chat client in all its glory: and just like any other regular browser window, you can maximize it, minimize it, restore it, and resize it. Now that you have opened the Facebook Chat client in a new window, you can use solely instead of the tiny inline popup you otherwise get in the bottom right corner of the screen; notice that you have access to all the commands and options you usually get. Since you now have your Facebook Chat conversations displayed inside a brand new web browser window, you have access to all the functionality your browser offers, including the ability to show web pages in full screen mode. Before we go on, note that some web browsers do not support this functionality, most notably Apple's Safari browser for Mac OS X or Windows 7 / Vista / XP. 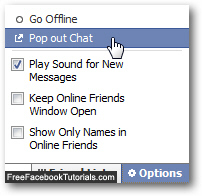 But you will be able to view Facebook Chat full screen in Internet Explorer, Firefox, Google Chrome, Opera, and others. To view the Facebook Chat client in full screen on Windows (all versions) or Linux (Ubuntu, SUSE, etc. ), just press the F11 key on your keyboard; to exit full screen mode, just press F11 once more. To view the Facebook Chat client in full screen on Mac OS X, check the browser you are using; again, Safari doesn't currently support the feature; Firefox and Opera should both accept the F11 key as well; for other Mac web browsers, check the keyboard shortcut for that command inside the "View" menu of a regular browser window.